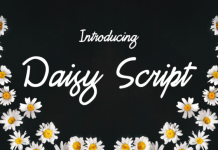 Clover is a beautiful charming script font that’s available for free. It’s a great font for projects that needs a personal look and feel. How about to use this typeface for blogs, posters, wedding invitations, business card designs and so on! The possibilities are endless with this eye-catching font. Download this free emoticon bundle today at fontbundles.com.